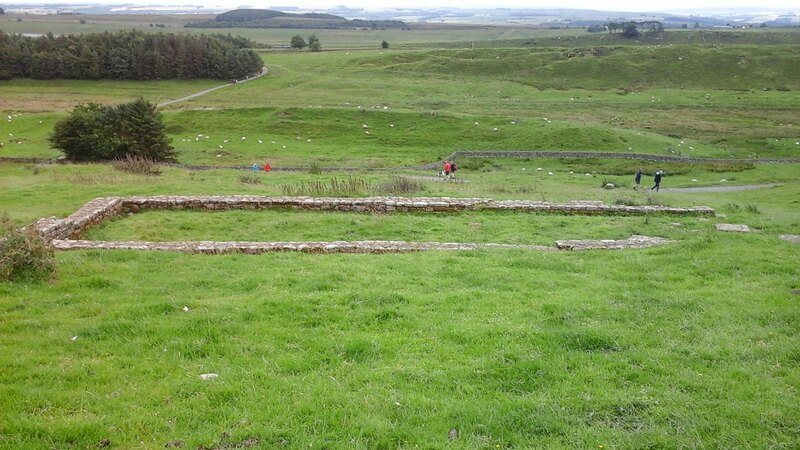 Housesteads Fort (Roman name Vercovicium) is a wonderful place to visit for its location and views alone but it’s also the best preserved of all the forts along the Wall. It’s a World Heritage Site and is owned by the National Trust and managed by English Heritage. 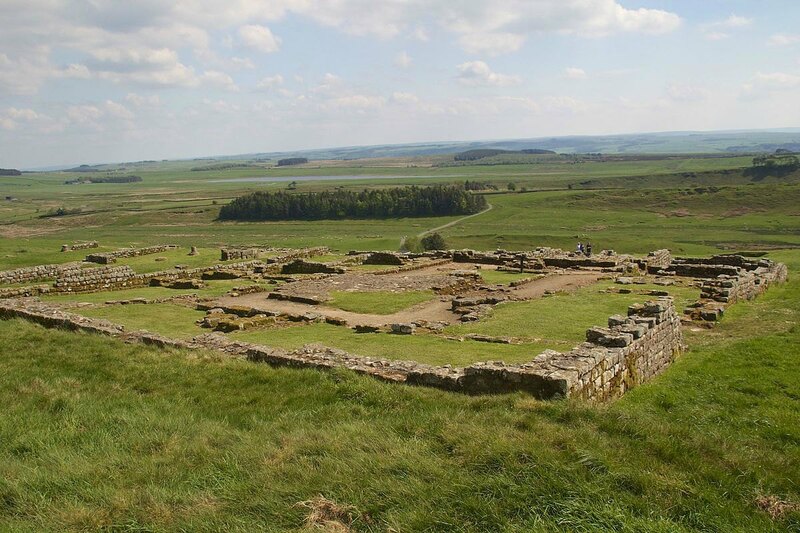 Housesteads is roughly half way along Hadrian’s Wall and is one of sixteen forts that housed around 10,000 men between them. 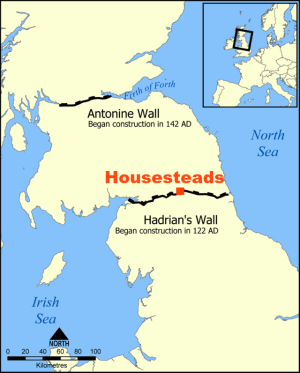 Archaeologists believe that the original plan for Hadrian’s Wall did not include forts, as several (like Vindolanda) were already garrisoned along the Stanegate Road a mile or so south. 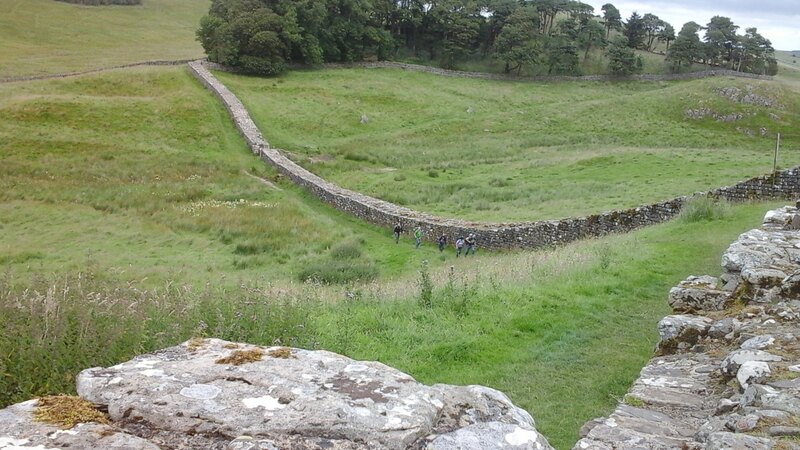 The first plan had only manned milecastles and turrets at regular intervals. Once work started, around AD 124, plans changed and a recently built turret was demolished to make way for this fort, the remains of which can still be seen today. The fort sits high on the escarpment of the Whin Sill ridge on the dip slope to the south of the Wall. At the bottom of the slope is the entrance to the site and where the visitor centre and main car park are located. 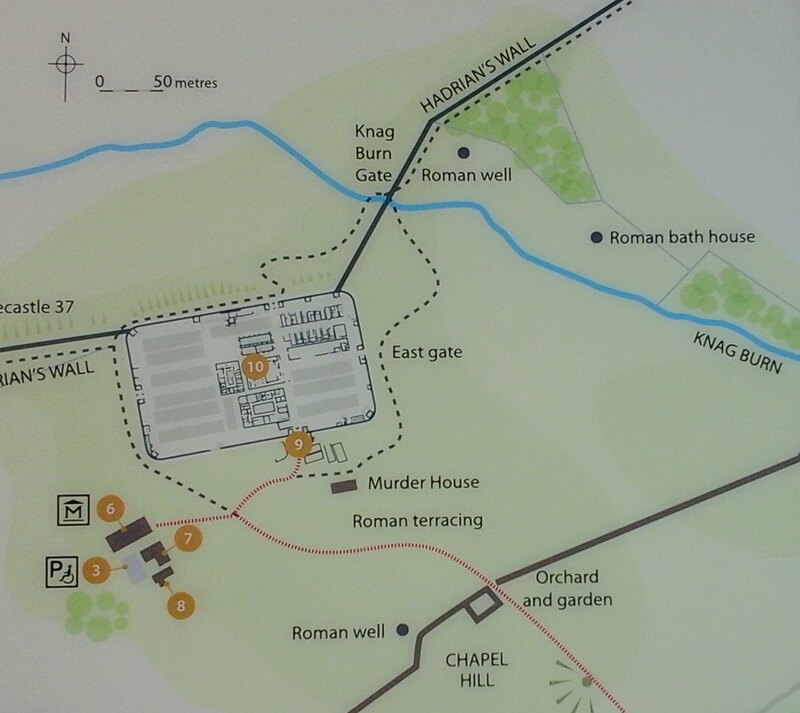 The map above is from an information board at the site. It shows the immediate location of the fort, the area to the south of it and the path along which visitors walk up to the fort from the entrance. Disabled visitors can drive further up to the disabled parking area (marked 3 on the map). The other numbered buildings are the little museum (6) activity centre (7) and a holiday cottage (8). The general car park, visitor centre and food and drinks kiosk are a little outside this section of the map. 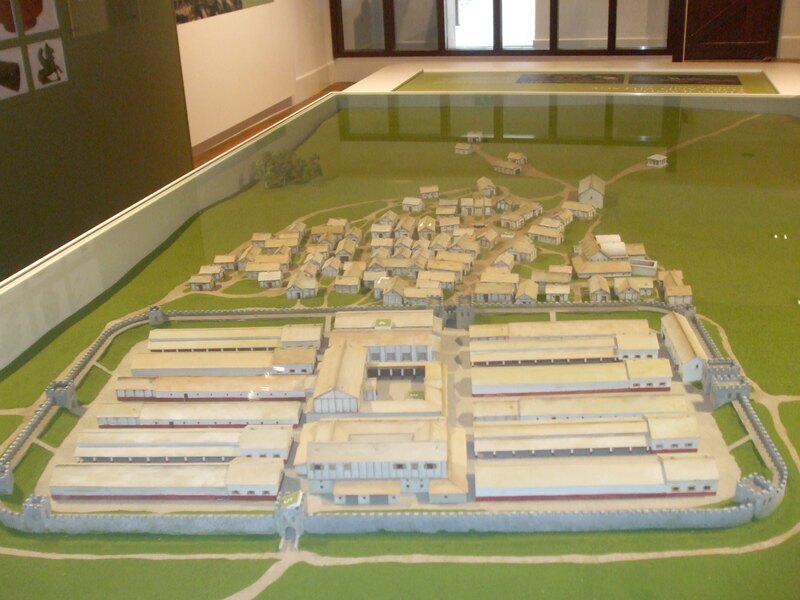 (10) refers to the fort and (9) is the vicus (civilian settlement). The photo below shows part of the same area, looking south from the fort to part-way down the hill. Some of the ruins of the vicus can be seen in the foreground. Looking north from the fort there are views down to the Knag Burn Gate (just visible in the photo in middle of the stretch of wall after the bend where the people are walking). 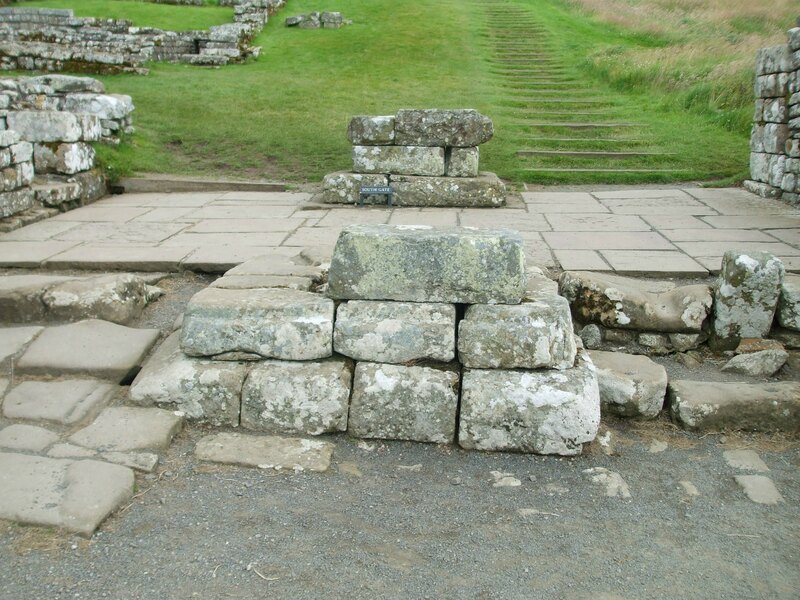 It is thought that this was inserted in the fourth century, possibly to allow easier passage through the Wall. Gates at either end of the passage suggest that travellers were held inside and searched. Open Northumbrian countryside stretches out beyond the photo and on to the Tyne Valley and Scottish borders. 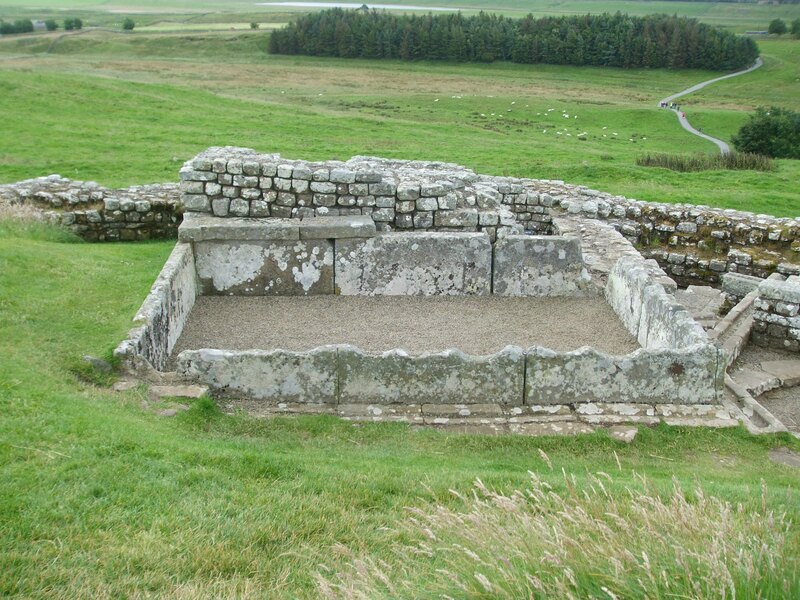 Houseteads has the usual, playing card shape of all Roman forts, its northern side lying along the Wall itself. 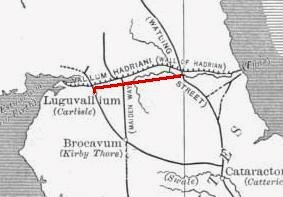 To the south are the ruins of the vicus. During excavations there in 1932, two skeletons were found beneath a newly laid floor. One, a man, had a sword still embedded in the ribs. The cause of death of the woman with him is unknown. Needless to say, the house has since been called the ‘Murder House’. In the centre of the fort are the main buildings. The most central one is the Headquarters, or Principia – the administrative, ceremonial and symbolic heart of the fort. It faced the east gate and sat at the junction of the major roads from the gateways. 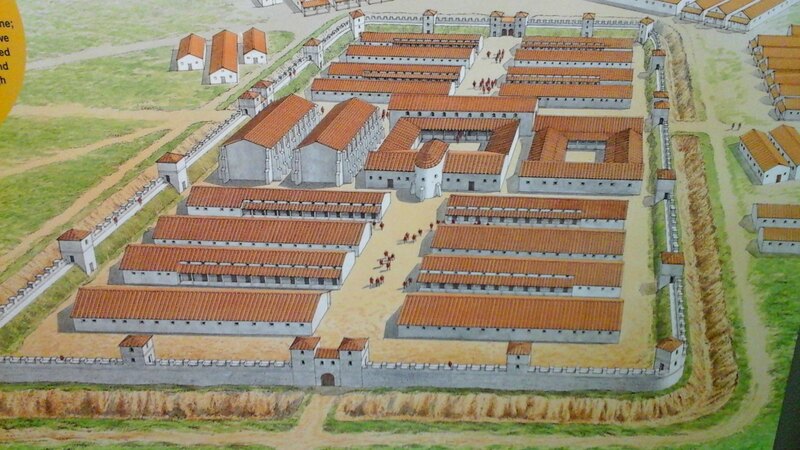 Next to that, on the southern side (right in the diagram immediately above) is the Praetorium or Commanding Officer’s House, with its central courtyard. The Commander lived in style and entertained a lot! At the opposite side of the HQ building are the usual granaries – vital to the feeding of the garrison. The impressive system of underfloor heating/ventilation can still be seen. 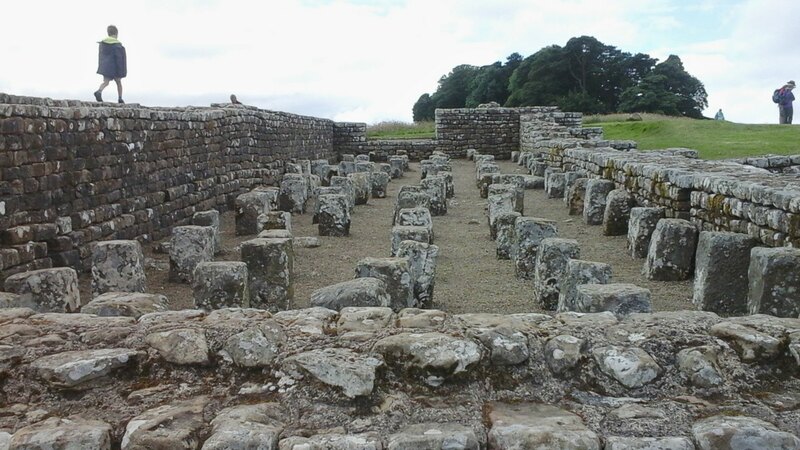 Another point of interest is that Housesteads had its own hospital with what archaeologists believe to be evidence of an operating theatre. On the above plan, the hospital sits behind (west) of the HQ building. Other buildings included stables and workshops – and in the far south-east corner, the lowest point in the fort, is an impressive latrine! 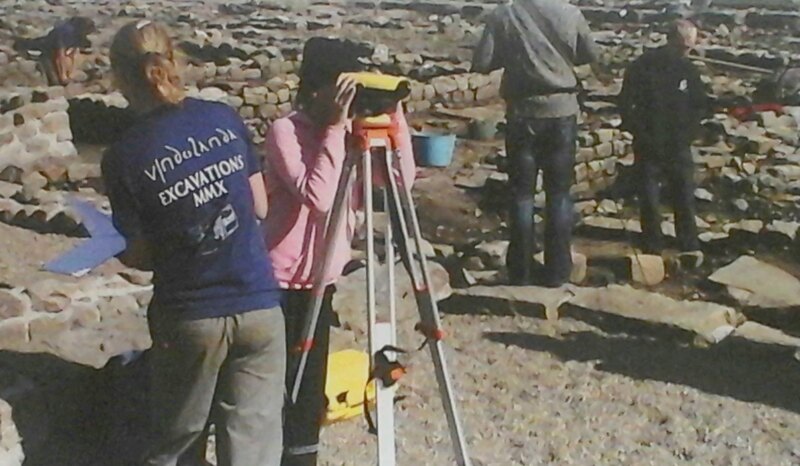 For eight years on the trot of going with the school to Housesteads, I seemed to land the roll of ‘Toilet Attendant’! I would stand up there while groups of about fifteen students at a time gathered round to listen to me deliver my spiel. For starters, it wasn’t an open-air venue and secondly, the men are not holding lollipops. Those items are simply referred to as ‘a sponges on sticks’ (although I imagine the Romans had other names for them). The drainage channels in front of them are where the sponges were put after use – ready for the next person who needed one. Who needs loo roll, when you can use one of those? However, there is no evidence that ‘sponges on sticks’ were ever used in Britain. 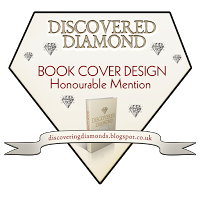 The artist’s impression above is based on evidence from Roman latrines around the Mediterranean. 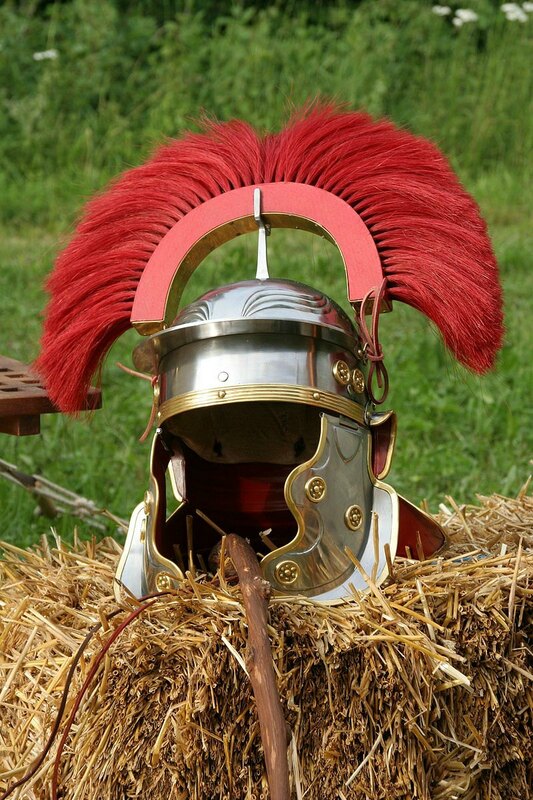 It could be that Romans in Britain used the same ‘toiletries’ as the rest of the ‘barbarians’ – grass, bracken or moss. 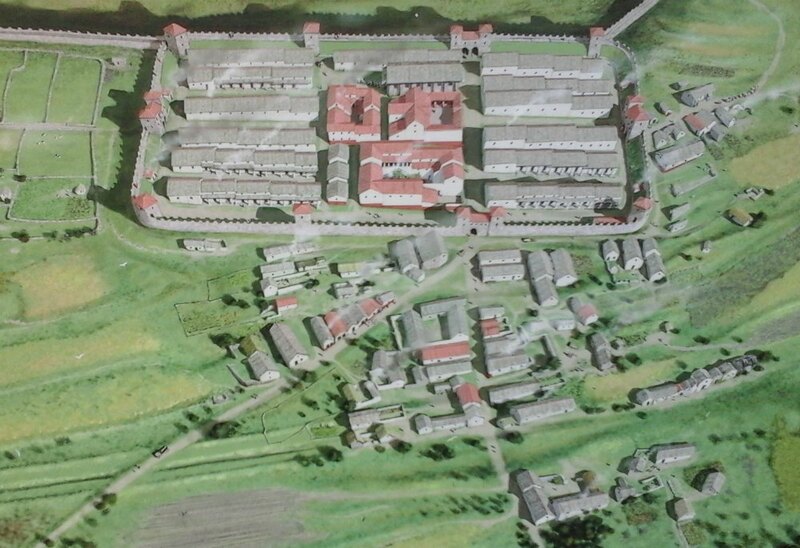 After AD 300 major changes were made to the fort, possibly linked to the way in which the Roman Army was now organised. The old barracks – which housed a century of men (i.e. 80) in ten compartments – were demolished and replaced by chalets for individual soldiers, suggesting that the numbers of men stationed there were declining. 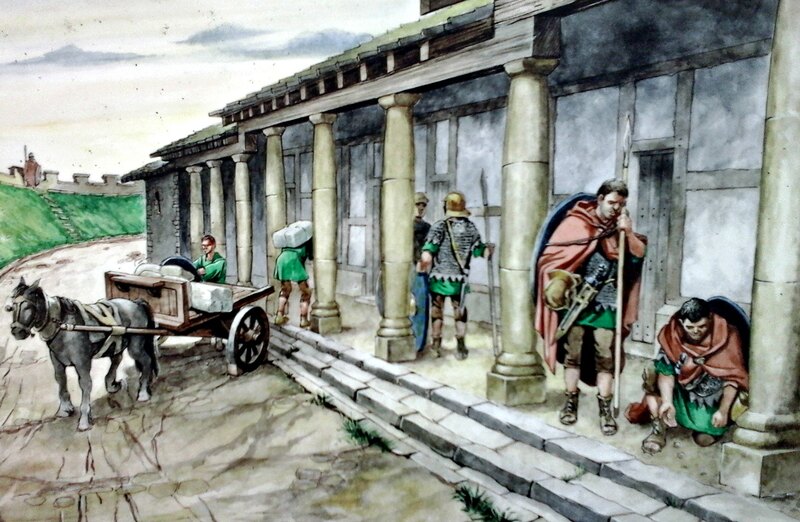 The west gate was blocked with stone and in the fourth century, a new bath house was built inside the fort and the isolated, outer one abandoned, suggesting that the security of soldiers may have been a concern. 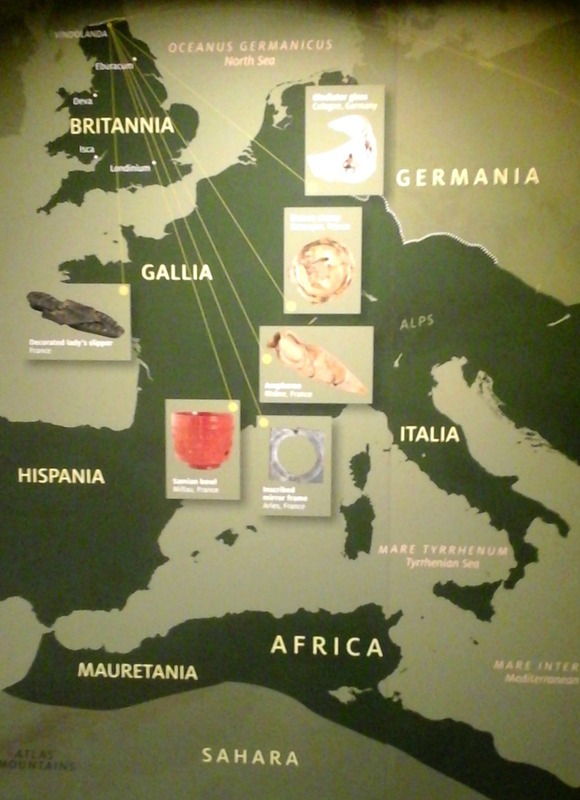 By AD 410,the Roman Army had been withdrawn from Britain, leaving these islands wide open for attacks from peoples from continental Europe: Angles, Saxons, Jutes, Frisians and a few hundred years later, Danish and Norwegian Vikings. And last but not least were the Normans in 1066. Some of he many ‘finds’ from Houseteads can be seen in the little museum. 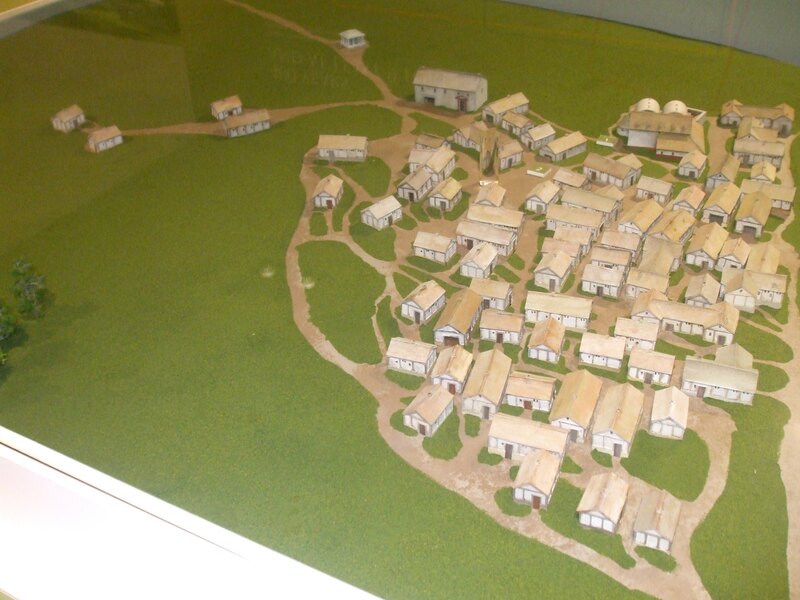 Others are housed at the museum at Chesters Roman fort further east, and others at the Museum of Antiquites in Newcastle. 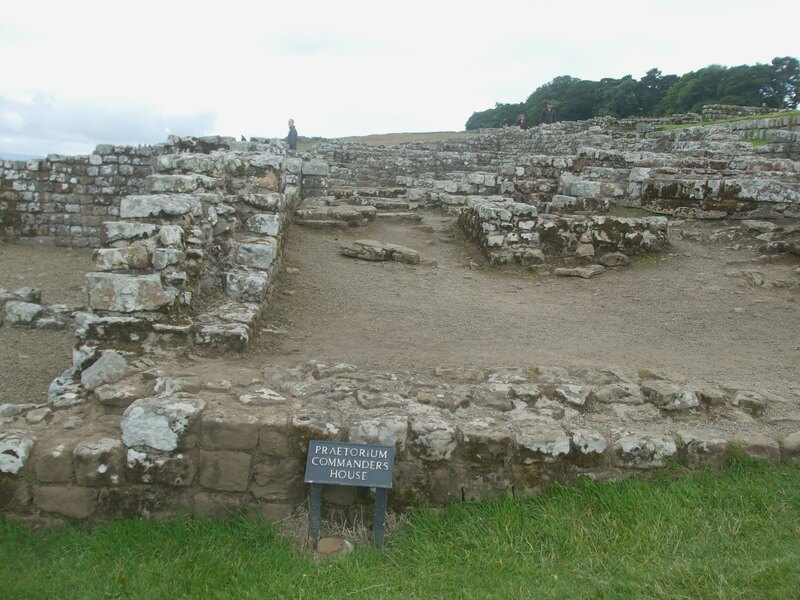 All images, other than two from Wikimedia and my own photos are from information boards around the Housesteads site. Information from the same boards and a variety of booklets form the site. 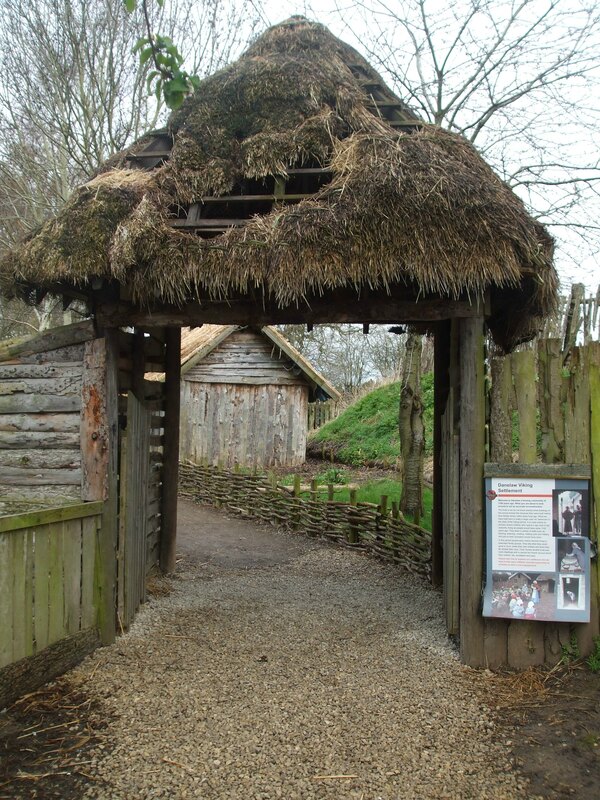 Last Saturday we had a great visit to the Murton Park Viking Village which is on the site of the Yorkshire Museum of Farming just outside of York. Although we took lots of photos of wonderful old farm machinery, this post is not about old farming methods on this occasion. Today I want to focus on Vikings! “Jorfor and his family are hunters and trappers, most of them originally hailing from the Troms area of northern Norway, though they have travelled far across the Viking world, some further than others, and settled in many different lands”. 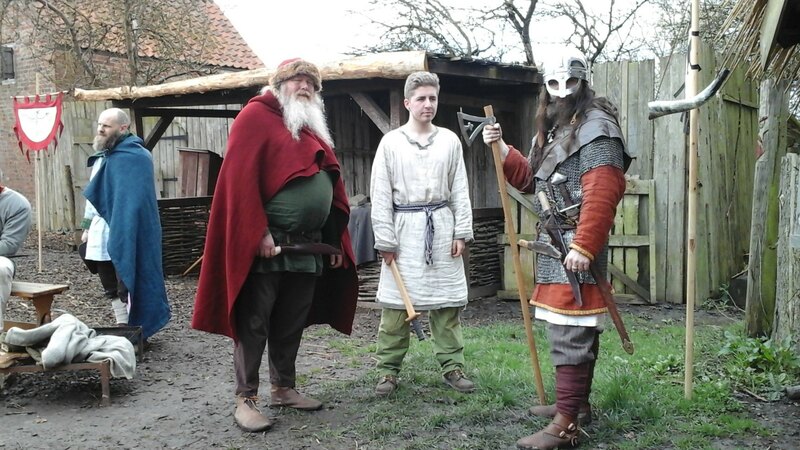 The group takes part in Viking events all over the country, as well as featuring regularly at Murton Park. Events are tailored for a variety of needs including school parties, youth clubs, fairs, fetes and shows. They also take part at the Jorvik Viking Festival in York in February. The weather on Saturday morning was a bit dreary to start with, and it was very wet underfoot, but that only served to illustrate the conditions people would have lived with 1100 years ago. Most of the pathways through the settlement were wood-planked, to counteract the mud. This tallies with what I found when doing my research several years ago about the Danish trading town of Hedeby. This was the man in charge, the chieftain of the village, wth the very appropriate name of Bear. Thankfully, he was a very friendly bear and told us a lot about the great helmet he’s wearing or holding in these photos, as well as how it compares in battle to the one on the stool. I’d run a mile fast if I saw someone coming at me wearing a helmet like that – and that, according to Bear, was exactly what the helmet was supposed to do: terrify people (especially when the man wearing it was as big as Bear!). The helmet, however, was not the typical Viking style; the more usual design being like the one with a nose guard, shown on the stool. Bear’s helmet is a replica of a famous one discovered in Norway. I think (but I’m not sure) Bear said it was the one found in a 10th century chieftain’s grave at Gjermundbu. I found this picture of it on Wikimedia Commons. 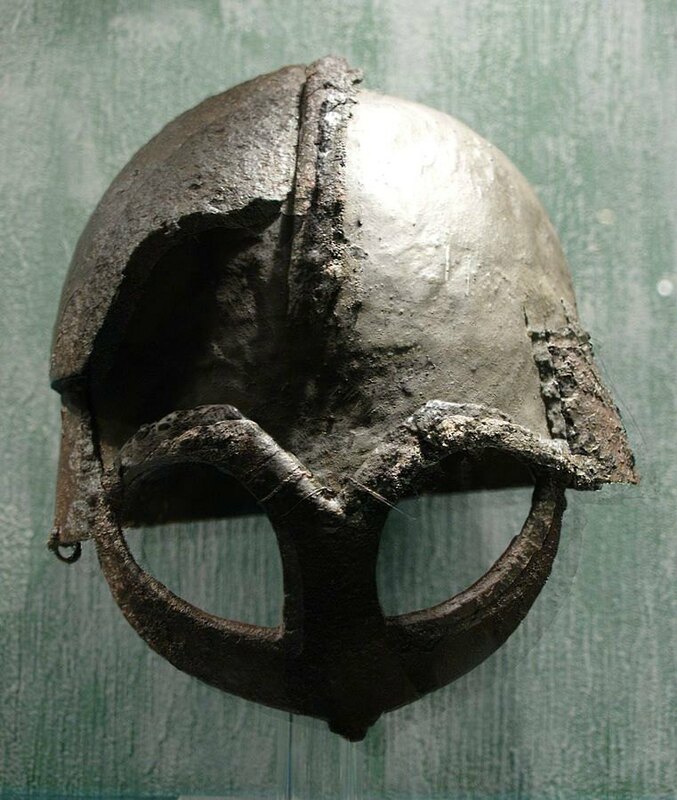 However, Bear did say that this helmet could be one that had been brought back from the East (trade or raid) and the style was not adopted for long amongst the Vikings. Although the facial shield and eye mask are intimidating to say the least, they could be disastrous in battle. A sword thrust into an eye socket would direct the sword straight into the eye! With the more usual nose guard, there was the possibility of the sword being deflected away from the eye. To finish with, these are a few of the villagers themselves, some about their work, others just cooking or socialising. Jobs and trades around the village would be many and varied, and of course, warriors would always be on the alert in case of attack.
. . . and the cross section through the hull of a reconstructed Viking ship that greets visitors on the way in. 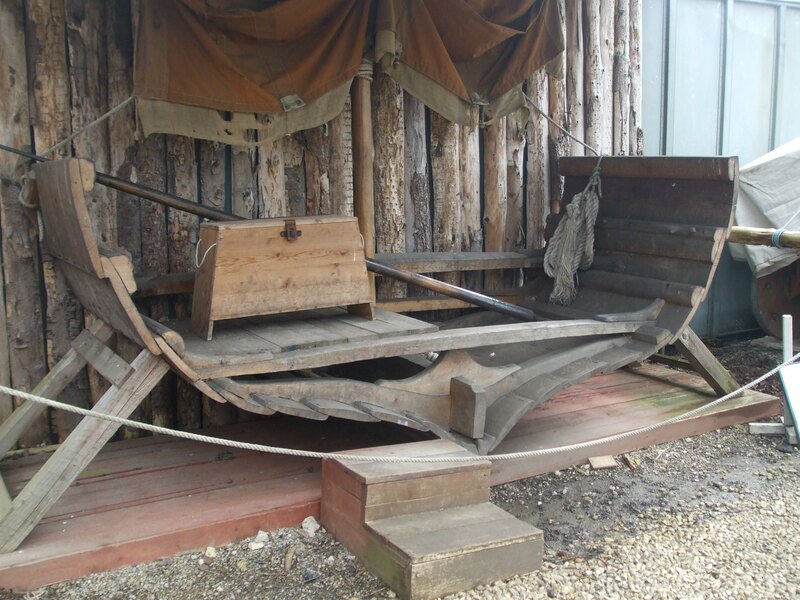 It shows how Viking ships were built using overlapping wooden planks (known as clinker planking) which made them waterproof. This technique is still used today in wooden ship construction. 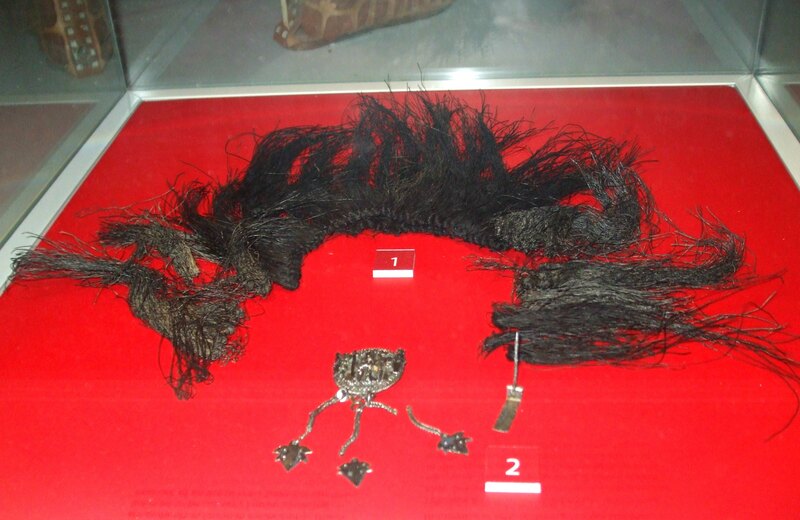 It was donated by the Yorkshire Museum. I’ve been away in York for the past five days, during which time we visited several interesting sites. We decided to go to York initially to visit a Viking Village at Murton on Saturday, but we managed to fill the rest of the days very nicely, too. I must apologise for not visiting blogs at this time, as the internet connection in the hotel was more off than on. I hope to get to as many as I can in the next few days. Anyway, the Mother Shipton site was the first one we visited and here’s some information about it. 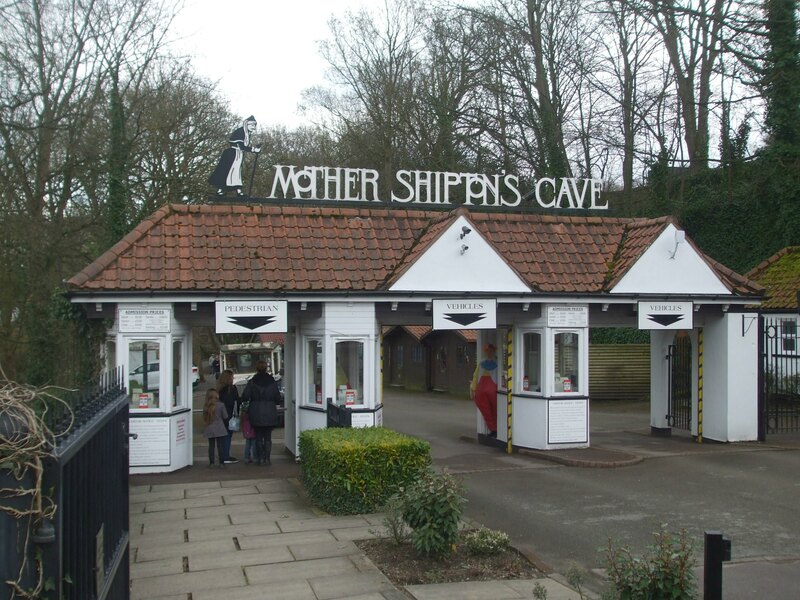 Mother Shipton’s Cave – a site which also includes the Petrifying Well – has been England’s oldest visitor attraction since 1630. 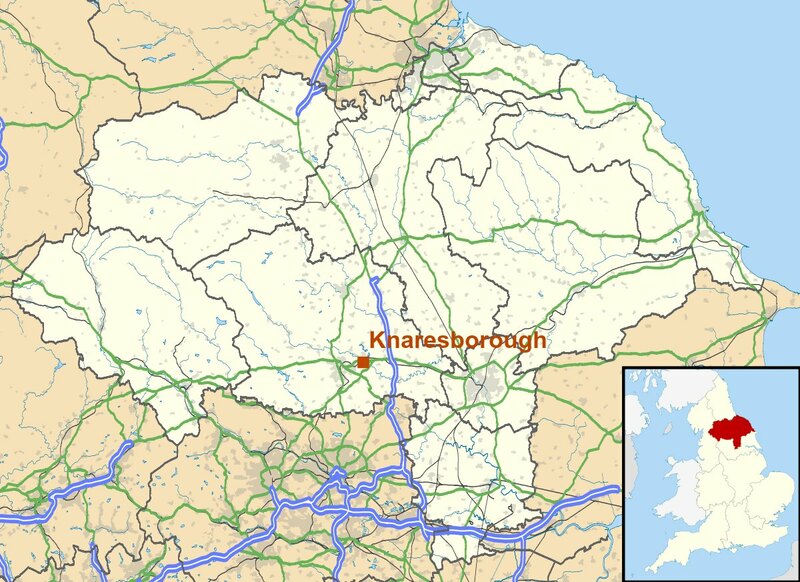 It’s located in the historic market town of Knaresborough, four miles east of Harrogate, in North Yorkshire, UK. Map of North Yorkshire, UK. Author Nilfanion, created using O.S. data. Creative Commons. This famous attraction sits in unspoilt parkland, a remnant of the once extensive Royal Forest of Knaresborough. The park lies along the banks of the River Nidd, which at this stage, flows through a gorge created by a glacier during the last Ice Age, 12 000 years ago. There are many lovely views across the river. Some simply look over to the buildings of the town, others to the gorge and Knaresborough Castle sitting atop it. And across an impressive, roaring weir is the old mill, aptly known as Castle Mill. There are also great views of the viaduct carrying the railway, and the lower (in height) bridge known at the High Bridge. Any object left in this well for a period of months/years becomes ‘stony’ on the exterior. It’s a natural phenomenon, due to the evaporation of water with a high mineral content. Nowadays, objects from various ‘celebrities’ have been left to undergo transformation. But at one time, these strange occurrences at the Petrifying Well were believed to be the result of magic or witchcraft. People believed if they just touched the water they would be turned into stone. So, just who was Mother Shipton . . . ? Mother Shipton was born on a stormy night in 1488, with the name of Ursula Southeil. Her fifteen-year-old mother, Agatha, gave birth in the cave after being banished for refusing to reveal the name of the father of her unborn child. After two years of a struggling to survive in the cave, the fate of the mother and child became known to the Abbot of Beverley, who decided to help them. Little Ursula was taken into the home of a local family, but her mother was sent to a convent in Nottinghamshire, here she died two years later. As a child, Ursula grew to love Knaresborough and often played along the banks of the Nidd. At school she far surpassed other children at reading and writing, but her looks were what most people saw as ugly. The other children taunted her and ridiculed her long, crooked nose, bent back and twisted legs. They even claimed she took her revenge, and could feel her by pulling their hair and pushing them to the ground – when she was nowhere near. Old engraving of Mother Shipton. Author Unknown. Public Domain. Ursula soon realised that she much preferred to be on her own, and came to spend most of her time in the cave. Despite having no memory of having lived there, she claimed it drew her back. She learnt much about the forest, its plants and herbs, and how to make cures for ailments and various potions. She also discovered, she was able to predict the future, and her prophecies are what she became famous for. At twenty four, Ursula met and married Thomas Shipton, a carpenter from York. For two years they were very happy, but Thomas died young – before any children had been born. But Ursula kept the name of Shipton, and as she aged, the title of ‘Mother’ was added to it. She died in 1561 at the age of seventy three, but her prophecies lived on . . . 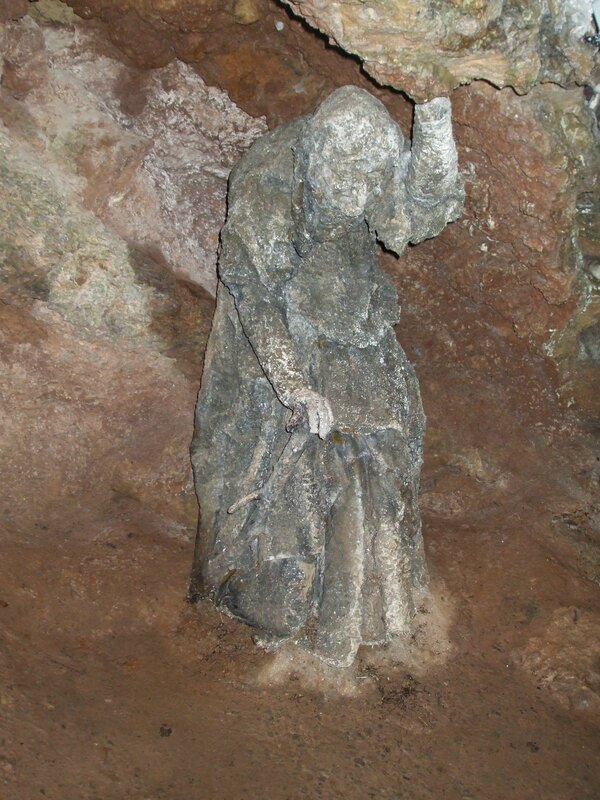 Mother Shipton made many prophecies, several about people who lived during or just after her own lifetime. She predicted the end of the Catholic Church in England under Henry VIII and the fall of Cardinal Wolsey. She also foretold the death of Henry’s son, Edward VI, the ‘bloody’ events of Mary’s reign and that her sister, Elizabeth, would take the throne. Mother Shipton also foretold the coming of the Spanish Armada and, according to the diary of Samuel Pepys, the Great Fire of London in 1666. Its true author, Charles Hindley, later admitted in print that he had invented it. Mother Shipton Moth, named after the pattern on the wings resembling the face of a hag. Author Callistege – mi_02 (xndr). User: Sydmolen. Creative Commons.